NEW YORK -- Madison Keys completed the clean sweep for American women, giving the host country all four U.S. Open semifinal spots for the first time in 36 years. The 15th-seeded Keys served impeccably, controlled groundstroke exchanges from the baseline and was never in trouble during a 6-3, 6-3 victory over 418th-ranked qualifier Kaia Kanepi of Estonia that lasted only 69 minutes Wednesday night. That came several hours after 20th-seeded CoCo Vandeweghe's 7-6 (4), 6-3 elimination of 2016 runner-up and top-seeded Karolina Pliskova of the Czech Republic. Pliskova's loss means she will be replaced at No. 1 in the rankings by Wimbledon champion Garbine Muguruza. On Thursday, Keys faces Vandeweghe - with the winner reaching her first Grand Slam final - and No. 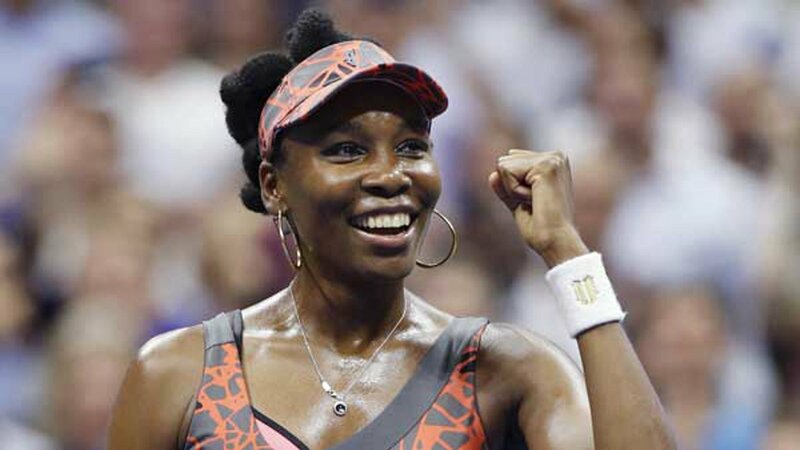 9 seed Venus Williams meets 83rd-ranked Sloane Stephens. "Oh, my God, it feels so good. We have so many Americans to talk about in the last days of the U.S. Open," Keys said. "I can't tell you how many times I have sat in this chair and had to hear, you know, how horrible tennis is in America." Williams, whose seven major championships include the 2000 and 2001 U.S. Opens, and Stephens won quarterfinals Tuesday. "American tennis," said Stephens, seeking her debut in a major final, "is headed in the right direction." Not since 1981 have there been four American women in the final four at the U.S. Open, when the quartet was champion Tracy Austin, runner-up Martina Navratilova, Chris Evert and Barbara Potter. It hadn't happened at any Grand Slam tournament since Wimbledon four years after that. While Williams is 37, the oldest semifinalist in tournament history, the other members of the remaining trio are all in their 20s. Keys, 22, had a rough start to 2017, missing the first two months after offseason surgery on her left wrist, and then had another procedure in June because of lingering pain. She was terrific against Kanepi, who sat with a white towel over her head during changeovers and dropped to 0-6 in Grand Slam quarterfinals. Keys set the tone in the opening game: ace at 108 mph, ace at 105 mph, service winner at 117 mph, service winner at 112 mph. She wound up with eight aces, part of a 23-8 in total winners. "This means the world to me," said Keys, also a semifinalist at the 2015 Australian Open. "If someone told me this is where I would be, right before Wimbledon, I wouldn't have believed you." The 25-year-old Vandeweghe, a niece of former NBA player and current league executive Kiki Vandeweghe, reached her first Grand Slam semifinal at the Australian Open in January. She was the junior champion in New York in 2008, but never had success in the main draw until now: Of her previous eight appearances, half ended in the first round, half in the second. One difference this time at the U.S. Open: Vandeweghe switched coaches midway through the season, teaming up in June with 1987 Wimbledon champion Pat Cash, who was nominated Tuesday for the International Tennis Hall of Fame. The biggest way in which he's helped, Vandeweghe said, "is channeling my intensity and tenacity out onto the court and putting it into a singular focus." "You will have to ask him how he's been able to do that. I don't really know. Maybe it's like some Jedi mind trick," said Vandeweghe, who still did not hide her emotions on court, such as when she cracked a racket against the ground after a second consecutive double-fault in the opening set. Regardless, pretty much everything Vandeweghe did worked against Pliskova, who leads the tour in aces in 2017 but found her top means of attacking opponents neutralized Wednesday. Vandeweghe wound up with more aces, 5-2, and even produced three service winners. "My best asset today was making her continually play on her service games. Whether it was not a great return that just got over the net, I know as a big server it's really annoying when your serve keeps coming back," Vandeweghe said. "I know that's what my main focus was - just to get it back, not have her have a free point too easily." Pliskova did not exactly heap praise on her opponent afterward. "Now I can say I was not playing my best tennis this tournament," she said. "She can play much worse than she was playing today. I can play much better than I was playing today. I didn't feel the best." Pliskova, who is from the Czech Republic, also offered this assessment of Vandeweghe: "She just (has) one plan, so either it's working or it's not."